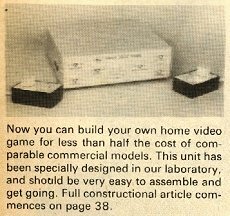 Although a few manufacturers sold video game systems in kit form (Videomaster is a good example), it was not rare to find a video game construction article in an electronics magasine. The less interesting articles use a dedicated chip like the AY-3-8500. The most interesting ones describe analog or digital systems designed with discrete components and are generally interesting to understand how a simple video game can be made without sophisticated components. Click the covers for more details about each article. 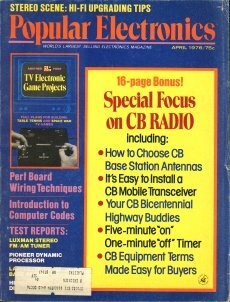 The earliest video game construction article known to exist. This simple game was clearly inspired from one of the Magnavox Odyssey games released to the public in May 1972. This game is also very similar to the Chase Game invented by Ralph Baer in 1966, which consisted of two spots chasing each other. One of the two players disappeared when hit by the other. This game shows the winner, unlike Ralph Baer's game which didn't do so (but only hide the second player). To finish, it is still interesting to note that the seven articles explain very clearly each part of the system: general aspects, how the objects are generated on the screen, how the bounces are made, how the collision detection works, etc... Thus, a good electronician could easily improve the system. This great set of articles is one of the best as it describes a rather advanced game which differs from the classic variants. 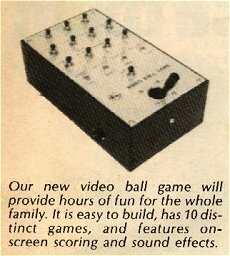 The original article published in November 1975 features an analog game made with TTL chips. It plays the classic Tennis game in its simplest form: only two paddles an ball. 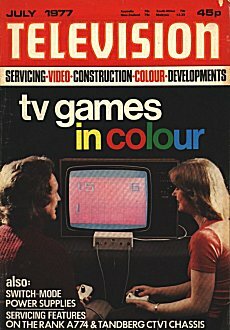 Issues 11 from March 1976 and 13 from May 1976 featured improvements adding new games, the central line, top and bottom boundaries, sound effects, on-screen scoring, and even a solo mode to play against the machine which never looses. 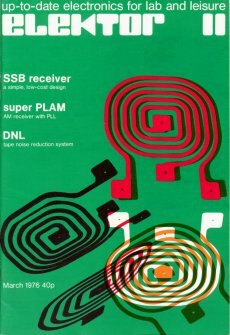 Two very interesting articles featuring different PONG variants. 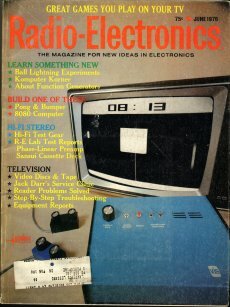 The first article features a 3-game project named Pongtronics. One game is Handball and the two others are Tennis variants, one of which is played with gravity where the ball no longer bounces on all the screen edges but as in a real tennis game (lateral view). The other project is called Space-War (it has nothing in common with the original 1962 computer game). Its game consists in shooting a missile (the Tennis ball) at the opponent. Both players are represented by the usual Tennis paddles. 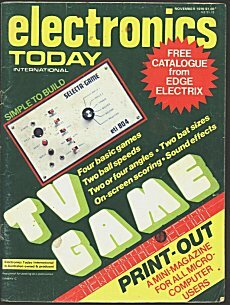 This Popular Electronics issue proposes an extension for the Pongtronics project published in the previous issue: on-screen scoring and sound effects. The interest of this project is to explain how early forms of on-screen scoring (without digits) are designed. Sound effects are added for bounces and scoring. An interesting construction article offering 32 game variants with unique effects, and designed with only 13 TTL chips. Video Ball could also be ordered in kit form. Another project which has two interesting points: the use of a large square bumper, and the digital on-screen scoring. 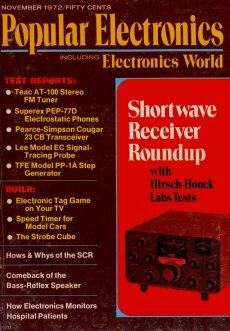 Yet we don't have the second issue containing the schematics of the digital on-screen scoring and sound effects add-ons, but this first part is still interesting for making the basic analog system. 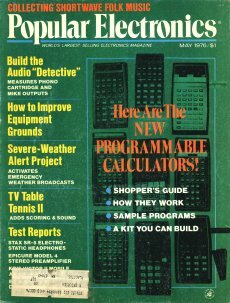 A typical issue covering a project based around the AY-3-8500 game chip. This type of project has the interest of showing the simplicity of a system based around the AY-3-8500, hence the success of that chip. ETI 804 was also available in kit form. 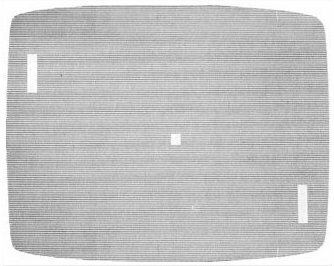 This interesting article contains the description of a simple project based around the MM-57105 game chip from National Semiconductor. Unlike most other hobbyist projects which generate a black and white picture, this one generates a color picture. 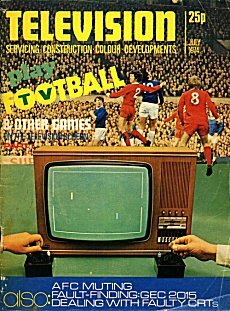 The article is split over the July and August 1977 issues. It even makes a comparison with the General Instruments AY-3-8500 chip in order to show the advantages of using the MM-57105 chip. Like with some other projects, the circuit board could be ordered. New Video Ball game is a simple project based around the General Instruments AY-3-8600 chip. 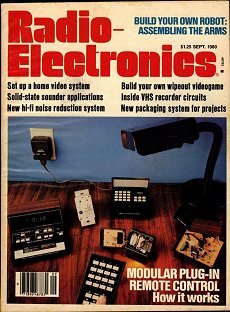 It obviously replaces the initial Video Ball project published in May 1976. Based on the General Instruments AY-3-8606 chip, Wipeout plays ten variants of the classic Breakout game for one or two players. Articles based on a dedicated video game chip usually feature the classic Ball and Battle games. Here, another General Instrument chip is used, which is quite rare. As with Ball and Paddle games, this project shows how dedicated game chips simplified the main electronic circuit and reduced the number of components required, hence the global cost.